Rats, mice, cockroaches, and bedbugs are part of daily life for most Single Room Occupancy (SRO) Residential hotel tenants like Jack. Tenants also live without basic services like heat, hot water, electricity, elevator service, water pressure, even, in some cases without locking doors. Jack, along with a small group of SRO tenants with the newly formed SRO Collaborative, a project of Atira Development Society, have banded together to do something about it and recently won two unprecedented victories at the Lion Hotel at 316 Powell Street and the Sahota-owned Regent Hotel at 160 Hastings Street. Owners of these hotels have been served written legal orders by the City of Vancouver, giving each landlord 60 days to comply with the city’s Standards of Maintenance By-Law. At The Lion, ‘slumlord millionaire’ Abolghasem Abdollahi has until Jan. 26 to bring heat and hot water to the building. At The Regent, fixing the heat and hot water as well as the repair of a door must take place before Feb. 15. If either landlord does not comply with these conditions, the City of Vancouver can step in and do the repairs, billing the landlord for the work. Although the Standards of Maintenance By-law has been in place since 1981, the City rarely “takes full responsibility” and bi-passes a landlord to do the repair themselves (only one time in Vancouver history, decades ago). 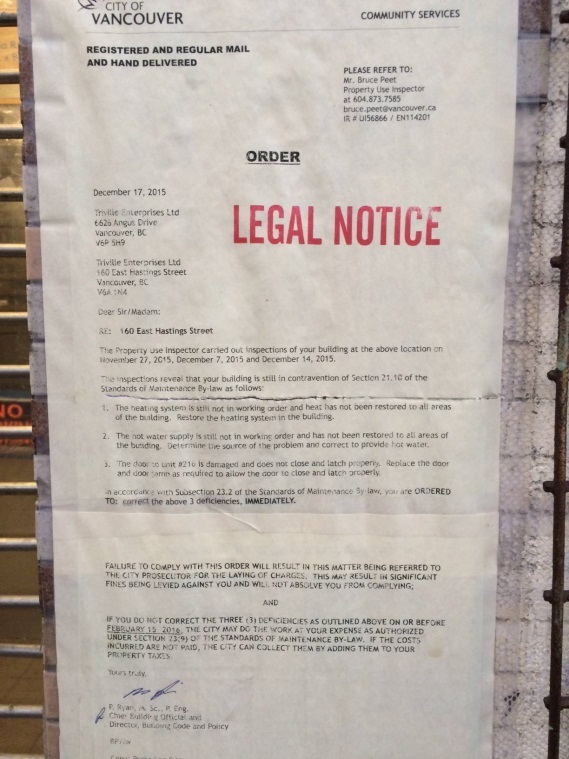 But it looks like it may happen at the Lion Hotel on January 26. The Collaborative will be there to make sure that the repairs are done. The Collaborative helped Regent and Lion tenants record the temperature of the heat and hot water in their rooms, call 311 to complain to city inspectors and also organized Residential Tenancy Branch hearings so they can get compensation for no heat and hot water. They also helped tenants navigate landlord backlash. Please join us for the 2nd annual SRO TENANT CONVENTION [click on poster below for more information]. Check out our last year’s (2014) SRO Tenant Convention highlight video. 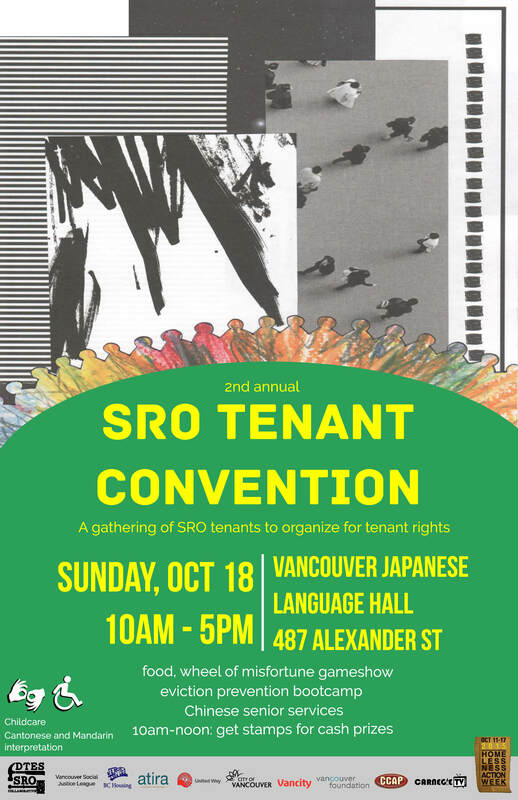 On October 19, 2014, we held the first SRO Tenant Convention at the Japanese Language Hall. Over 200 SRO tenants and community members came together to talk about taking action and responding to injustices tenants face on a daily basis. We had a delicious lunch made by our friends at WATARI. Check out the Convention video made by Indigenous Community Planner and multidisciplinary artist Wilson Mendes above. Callout for Chinese-speaking volunteers! Open House on July 4. Are you interested in volunteering with Chinese seniors in the Downtown Eastside? Come to this fun social event to learn more and to meet local Chinese residents! The SRO Collaborative is seeking dynamic multi-lingual candidates to serve as volunteers for the Youth for Chinese Seniors Project. Volunteers will shape the project’s first year and beyond, reaching out to Chinese seniors and families living in low-income housing in the Downtown Eastside. Outreach for this position is focused on youth, but anyone is welcome to apply. This is an 8-month volunteer position based in Vancouver Coast Salish Territories. The Downtown Eastside SRO Collaborative Project is working to improve habitability and prevent renovictions in SRO hotels in Vancouver Coast Salish Territories. Our strategy is to start organizing within the worst of the worst – the privately-owned SROs. We bring tenants together to file complaints for safety and management conditions at the Residential Tenancy Branch and to support City Inspectors’ efforts, where possible, to bring buildings up to code. The Youth for Chinese Seniors project, the Chinese arm of the SRO Collaborative, aims to gather a community of Chinese tenants to address housing issues together. Youth for Chinese Seniors volunteers will receive training on organizing skills, political education, housing issues, and elder issues. Volunteers will work on the ground with tenants to help them access the services they need, train tenants on housing rights, and identify the issues affecting Chinese residents in the Downtown Eastside. Because outreach to tenants usually takes place during evening hours and weekends, we prefer volunteers who have availability on weeknights and Saturday/Sunday. Volunteers should commit 5-10 hours/week. Volunteers may receive a small honorarium, subject to funding availability. The project runs from now until March. Applications will be accepted on a rolling basis. Send inquiries and applications to Chanel at chaanelly@gmail.com. In partnership with Anita Lau, the Downtown Eastside Women’s Centre Chinese Seniors Outreach Worker. Email chineseseniors@dewc.ca for more info. 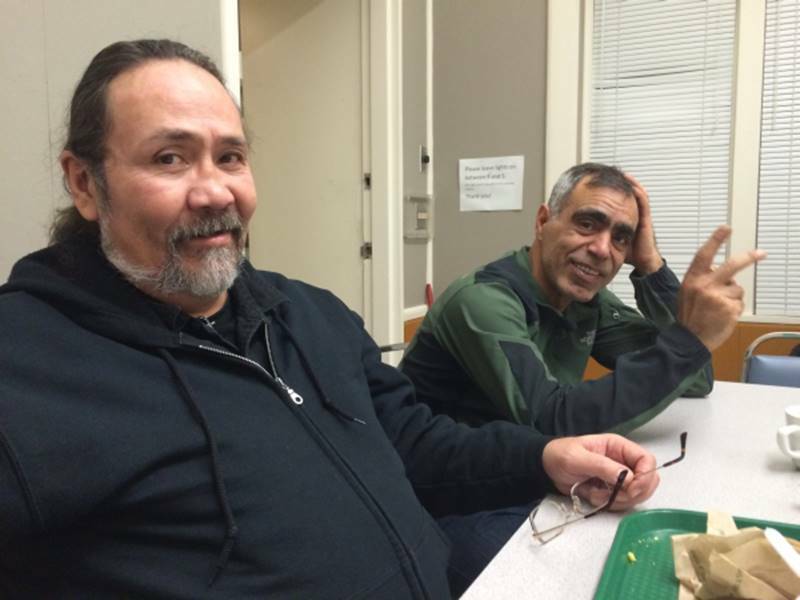 The SRO Collaborative has launched into the Downtown Eastside! West Hotel Tenant holding up evidence of rat infestation. Since January, the SRO Collaborative has been helping the remaining tenants on fixed incomes to get compensation at the Clifton Hotel (1125 Granville) which is in the last stages of emptying out and renovating likely for higher income renters. We are also at the West Hotel (488 Carrall) working to improve security, habitability and tenant rights. This is our organizing model – we will be taking on a building one at a time. West tenants will file a joint complaint through the Residential Tenancy Branch soon. If successful, over $20,000 will go into the pockets of the tenants! There are many vulnerable Chinese seniors living in SROs in the neighbourhood that are isolated and becoming increasingly impoverished. Chanel Ly, our Chinese advocate, will be coordinating tenant rights services for Chinese seniors in the neighbourhood and bringing young Chinese people to the neighbourhood to learn how to be advocates themselves. As we organize, SRO tenants will be producing short films to share their stories through video. This project will be led by Indigenous filmmaker and community planner Wilson Mendes. SRO tenants are invited to our strategy meetings every Saturday from 12 noon to 1:30pm at 253 E Hastings (next to the Ovaltine) starting on April 18, 2015! We’ll be choosing our next buildings to work in soon! Wheelchair accessible. Lunch will be provided. Wheelchair accessible. Lunch will be provided!